You started a job search for a reason, perhaps you feel stagnated in your current position or you simply want a new challenge? These underlying problems will not disappear with a new salary, how long until you feel this way about your job after accepting the counteroffer? From the moment you hand in that letter of resignation, you will never be looked at again in the same way within the company. You may have a raise for now, but for future promotions or opportunities in your company, the disloyalty will work against you. The cost to hire a replacement and train them, particularly for more senior roles, costs a significant amount of money. Counteroffers can often be a measure to simply avoid the time and effort required to recruit a new employee. If so, what is the benefit of staying for your career prospects in this company? Counteroffers aren’t in your best interest; they are made for the benefit of the company costs. 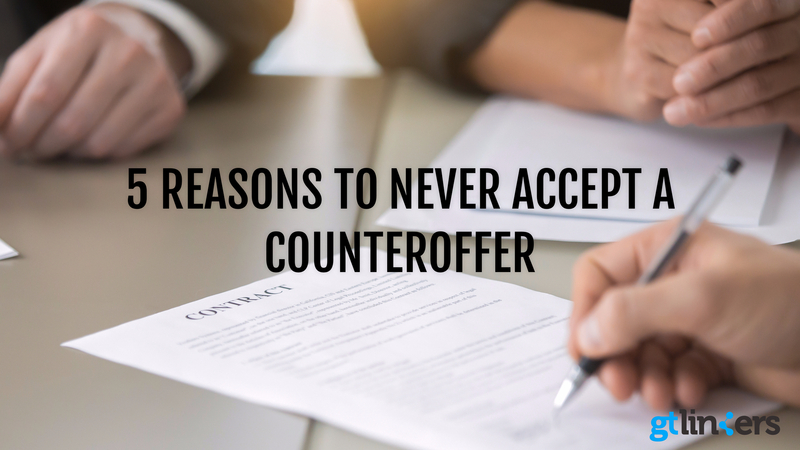 Accepting a counteroffer also impacts the recruiter, your potential employer and everyone involved in the process. With LinkedIn and other social media sites – your network and what they think about you, plays bigger part in recruitment nowadays. Therefore accepting a counteroffer may impact how you are considered by your network when it comes to new opportunities. Although you might be happy accept a counteroffer and staying in your existing role, you were most likely looking for a new job for more reasons that just money. A higher salary might be attractive, but there is much more to job satisfaction than the pay! If you are a candidate looking for new opportunities, why not get in touch and see how we can help you?